The actual use of Bento is to induce healthy everyday eating, and also to keep track of portions if you are dieting. 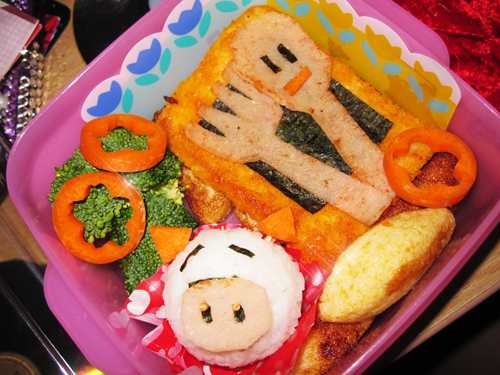 Traditional bentos usually have healthy ingredients and lots of veggies. Most of the time, japanese cuisine. However, my type of bentos are not necessarily healthy. I seldom fry veggies, and my main dishes are usually meat. I dont cook japanese cuisine. I do mix cultures (mostly chinese & western). My type of bentos are for people who dont have that culinary talent, yet have an interest in making nice food. 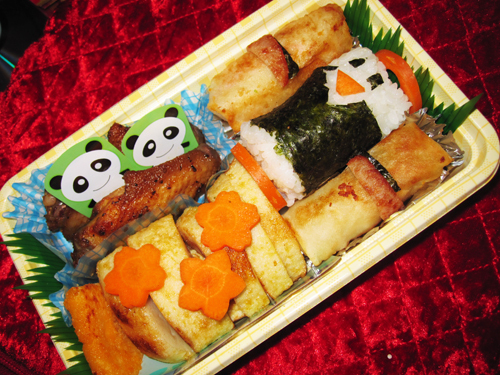 The most important factor in my bentos are that they are easy to make, affordable, and interesting with the designs. 1)fish - just a frozen fish cutlet bought in a box from supermarket, with a piece of seaweed on top. 2)forks and spoon ham - craved out using a knife, and decorated with facial expressions. 3)sliced fishcake - below the fish cutlet and side. Floral dividers and cupcake holder for the riceball. Moulded into cylinder shape. Added expressions using carrot and wrapped with seaweed.